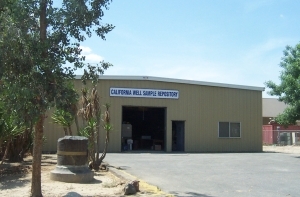 We are the only facility in California providing permanent storage and public use of cores, sidewall samples, drill cuttings, outcrop samples, microfaunal slides, foundation borings, and mineral suites. Our collection, started in 1975, is housed in two 6,000 ft2 buildings on the campus of the California State University at Bakersfield (CSUB). 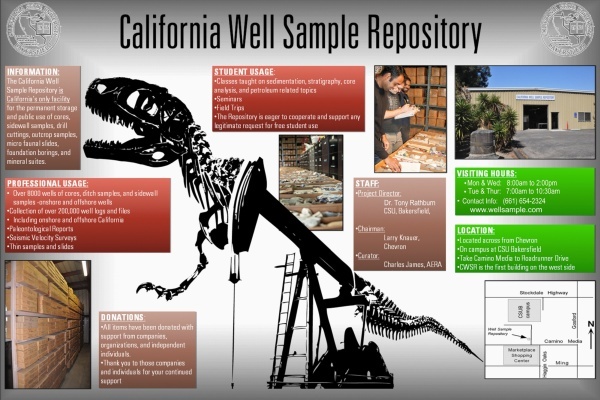 Our catalog lists tens of thousands of core, cuttings, well logs, and paleontology samples that are available for view from the thousands of California oil, gas, water and core wells stored in our collection. This catalog, which is in Microsoft Excel (.XLS) format, is available for download from this website. You may also visit us in person, and you will find us on the west side of Roadrunner Drive, which is reached by entering the south gate of the CSUB campus from Camino Media Drive in Bakersfield. You can also email our curator, or call him at (661) 654-2324 for more information. Cores, ditch samples, and sidewall samples from more than 6,000 exploration and development, oil and gas wells located throughout onshore and offshore California are in our collection. This material was donated by a large number of operators and individuals, and represents samples not only from recently drilled wells, but also from some of the earliest cored wells in the state. Whenever possible, cores are center-sliced to enhance study. Materials are placed in standard-size cardboard boxes, labeled for retrieval, and stored on steel shelving. Ancillary data such as well histories, core descriptions, photos, analyses, and electric logs for many of the wells. Microscope slides processed for microfauna from over 2,000 wells and outcrop localities. Foundation boring samples, ocean bottom sediments from water quality control studies, and rock sample suites from mining districts and geothermal areas. Most of these cores and samples would never have been made available for study by the public, and would have been discarded and destroyed by their owners were it not for the Repository. Our collection includes materials from every major oil company in California, cores from many exploration wells drilled by independents, and cores from mining and geothermal companies.